I know, I know, I just posted Saturday and you are used to me posting once a week. There is a reason for this mid-week update--I have a very special interview for you, dear reader. Best-selling author, Jack Cavanaugh teamed up with the late Bill Bright to write a series of books, based in our history but relevant to our today. Dr. Bright has since gone on to be with our Lord but Mr. Cavanaugh has now completed the first book in their series. 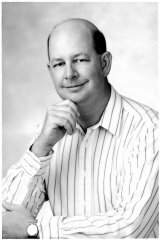 I am so excited to be able to bring you this interview with one of my favorite authors, Jack Cavanaugh. Enjoy! Tell us about the conception of The Great Awakenings series. JC: This series was born out of a shared desire for revival in our country. When Dr. Bright and I learned that we were both praying for revival, it seemed only natural that we would team up to write this series about the historic revivals in America. There are so many unexpected twists in Storm, were those plots twists made during the planning sessions with Dr. Bright, or were they inspired as you wrote? JC: The creation of a novel has many stages. Before he passed away, Dr. Bright and I met and prayed and sketched out the broad strokes for not only Storm, but three other stories as well. We knew that unless God intervened in a miraculous way, Dr. Bright would not be alive to see the release of any of the books. My task has been to bring our stories to life. As you researched the revivals that once swept our country, what most affected you? JC: Two things: First, that God so often chooses common, ordinary people to be the spark for the extraordinary outpouring of His Spirit. Second, the unexpected nature of revival. Not only the timing of revival, which is wholly in God's hands, but the unimaginable wonder of it all. The historical events that occurred are far more fantastic and wondrous than anything we could have imagined. 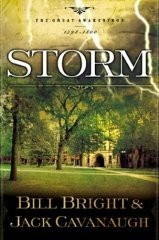 Do you consider Storm a character or plot driven novel? JC: Storm is a character driven novel. But don't mistake that for lack of action. Character driven simply means that readers keep reading because they want to find out what happens next to the characters. Storm is a personal duel between two men. Imagine if you were given the task of leading your greatest rival to the Lord. The one person you can't stand. The person who annoys and torments you endlessly. Then imagine you learned that God had chosen him, a non-Christian, and not you, to start a national revival. That's exactly what happens in Storm. What do you hope your readers will take with them from this series? JC: That's easy. When we began this project, Dr. Bright and I got on our knees and prayed that after reading these novels Christians would turn their hearts to God and cry out, "Lord, do it again." Until next time, Abundant blessings all! Yay to revival! Thanks for the interview Jennifer. I look forward to reading Storm. Yeah, he's one of my faves too. I had the privilege of listening to him teach the fiction track at Mt. Hermon five years ago. Can't wait to read his latest. I hope all of you enjoy Storm. It's the third installment in the Great Awakening Series, following Proof and Fire. I’m currently writing the final installment, Fury. Each of these stories has a common theme – the unexpected and amazing outpouring of God’s Spirit in America, whether it’s in New York City, colonial New England, Yale College, or upstate New York. Thank you Jenny for posting the interview on your blog. May God continue to bless you as you teach and write. Jennifer, I hope you're still using your notes from Mt. Hermon to write your own stories. :) May God bless all your writing efforts. Julie, I second your “Yay to revival!” Thank you for joining with me in praying for revival in our country. Bless your heart. Joy, I too remember scheduled revival services. Seems sort of strange to schedule revival, doesn’t it? Here’s praying we see an amazing unscheduled outpouring of God’s Spirit across our land. Blessings to you. Julie, trust me, it is my pleasure. I also am looking forward to reading Storm. Thanks for stopping and posting. Jen, that must have been great! You will have to tell me all about it. BTW, there was no chocolate the last time we got together--this will cost you. Joy! so good to see you! I'm proud of you for being brave and posting a comment:-)And you can ask me anything, including about my girls. I'll see you at church! Mr. Cavanaugh, thank you for visiting and posting. My prayers are with you in this endeavor. May Storm and the rest of The Great Awakening Series be a catalyst for a modern day revival now when we need it so much. Thank you again for stopping by. I cannot wait to read Storm. JC on JC writing about JC! Who would've thunk.